Killamarsh Secondary School Teachers and Kitchen Staff. Can you give the year. See note below. Photo courtesy of David Nicholls. Caretaker Mr Fleet middle row right. Is the man between him and Mr Chambers Mr Griffiths? Back row: Know the faces but can’t remember their names – that’s shocking, but I am getting on! Middle row 3rd fom left is Mrs Beech. Pic taken in the school hall by the looks…where the Thursday night disco for the DJ’s “Wham” collection were played lol. Killamarsh Secondary School Teachers and Kitchen Staff. Can you give the year? Can you fill in the unknown names? Back row: Edith Gascoigne, ?, ?, Rhoda Rear. Middle row: ?, ?, ?, ?, ?, Mr Fleet. 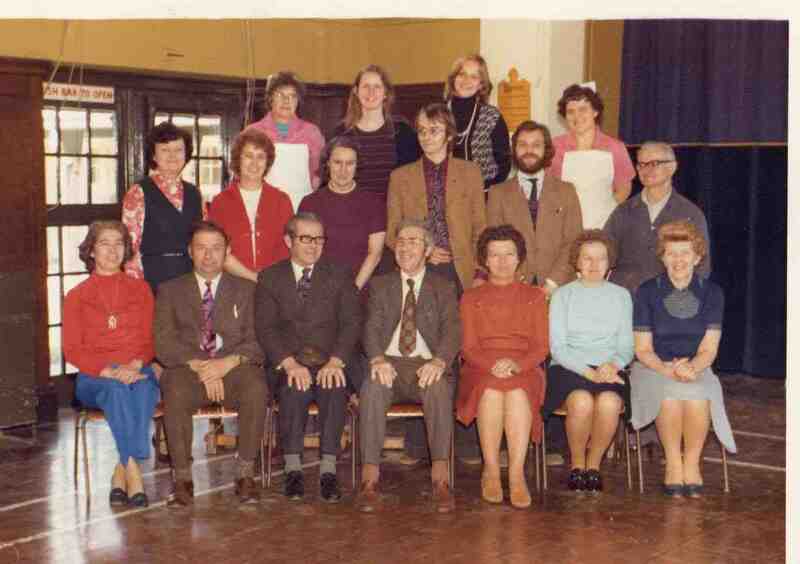 Front row: Mrs Burton, Mr Large, Mr Lowe, Mr Howdel, Mrs Whitfield, ?, ?. The young tall man on the second row is called mr chambers . Claire, you are correct, think the one next to Mr Chambers may have been Mr Morton? He used to coach school football team if I recall? Mr Large (front) and Mrs Whitfield (front) were my teachers and harry Howdel (spitfire) was the head. Crazy but very fond memories.